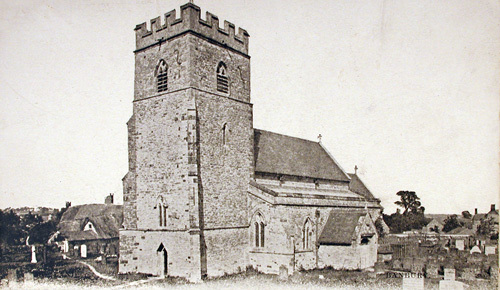 There has been a church in Sulgrave since the 13th century. 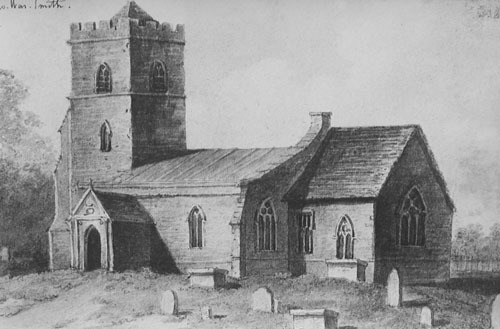 The original church is believed to have stood near the old windmill on higher ground about 1/4 mile away to the north of the present church and probably served the village of Culworth. Whilst all the old church records were destroyed in a fire at the vicarage around 1700 it is evident from the list of vicars that an incumbent has served the village since 1222. The history of the church is closely bound up with that of the Manor. In the early 13th century both were owned by the Cluniac monks of St. Andrew's at Northampton to whom ownership was passed by Bartholomew, son of Godfrey de Sulgrave. The gift was confirmed by the Bishop of Lincoln (1209-1234) in whose time the vicarage was endowed. The present church dates from the late 13th century when the tower was built from stones transferred from the "old windmill" site. It is architecturally the most interesting feature of the church and contains, at the west side, one of the three main doorways which are available to the church as it is today. The tower as originally built was probably lower than at present and crowned by a spire. Towards the end of the 14th century the spire collapsed, possibly as the result of being struck by lightning. The tower was partially reconstructed, but without the spire and somewhat higher, using the old material, and a new west window inserted. Finally at the beginning of the 15th century it was completed by perpendicular battlements without pinnacles. Internally the ground floor area of the tower was enclosed by a screen in 1929. This screen, of solid oak, was executed by craftsmen at Broadway in Worcestershire and included a door to the present vestry. The screen was presented by the Women's Committee of the George Washington Institute of America. 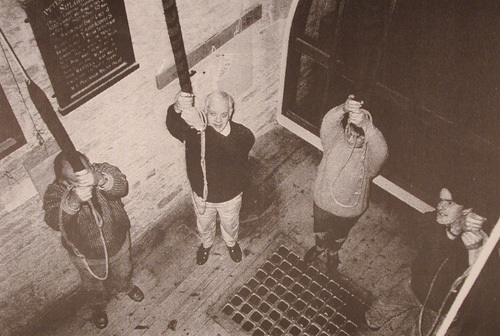 From the vestry access is gained by iron ladder and trap door to the bell-ringing chamber, although the sanctus or priest's bell can be rung from the vestry itself. The ringing chamber, with its six ropes, each with a coloured nylon sally, gives access in turn to a clock chamber and, above that, the bell chamber. The clock was presented in 1928 by Mr C.H.Godfrey in memory of his father, mother and sister who worshipped here. Until recently winding was carried out by hand but an electrically powered system has now been installed as the gift of parishioners, the Cherry family, in memory of a relative. There is a peal of six bells lately well maintained and for which sufficient ringers have been recruited locally to enable peals to be rung for services and on other appropriate occasions. The church doors already mentioned were erected at various times, the west, or tower, door in the 13th century, the north door in the late 14th century and the south door in 1564. Each of the doors has served as the main entrance to the church during its history according to the development of the village. The west, or tower, door was the original door and is opposite the site of Sulgrave Castle which today is marked only by a raised mound. This doorway is undoubtedly Saxon and the straight pointed arch formed of two stones inclined to meet each other indicates that it could date from the 10th century. The door is no longer used having been replaced as the main entrance by the north door from the 14th century. The north doors, enclosing a porch, are a beautiful example of 14th century work although moved outwards and reconstructed in original form during the church enlargement works of 1885. The porch contains a small window which may be older than the church itself and the window sill is formed of the lid of an old coffin. In 1924 the northern approach to the church was greatly improved by the removal of some old buildings and the purchase of land down to the main road which allowed a diagonal path from the porch to a point opposite the Parish Meeting Room to be replaced by a path straight from the porch to an arch beside the main road. The land made available was enclosed and consecrated as a churchyard in 1925. The south door and porch are the present means of access to the church through the Church Street lych gate, which was donated in 1929. Approaching slowly, to appreciate fully its beauty, one sees the date of 1564 above the outer arch (unlike the north entrance there is no outer door) clearly indicating its erection in Tudor times. 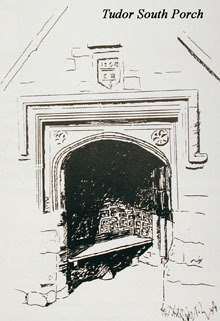 The Tudor origin is further borne out by the flattened arch which is the style also adopted for the Manor House entrance. Immediately below the date are the initials E.R. for Elizabeth Regina. The queen is known to have been in Northampton, only 20 miles from Sulgrave, in 1564 and the initials may well commemorate her visit. However, the porch is believed to have been erected to commemorate the death on 6th October, 1564, of Amee, wife of Lawrence Washington and mother of his 11 children. A single fleur-de-lys above the archway is of significance in linking the church to the Washingtons and the Manor since it also appears on the gable of the Manor House porch. The church structure has evolved since the 13th century as the village itself evolved and increased accommodation was required for its parishioners. The stages of the church's evolution are shown here in some detail. Thus the only other major alterations to the structure occurred about 1840 when, larger accommodation being required, the ancient nave roof of oak was removed and a deal roof substituted in order to allow the walls to be increased in height by about 6 feet. Galleries were added and the windows reduced in height. The major works of 1885 included the removal of the galleries and replacement of the oak ceiling, thus restoring the imposing appearance of the church. At this time, due to the number of internments which had taken place in the churchyard, the soil had built up to as much as 12 inches above the level of the church floor. By lowering the soil level the general scale of the building was improved and the gravestones and tombs were re-established at this lower soil level. 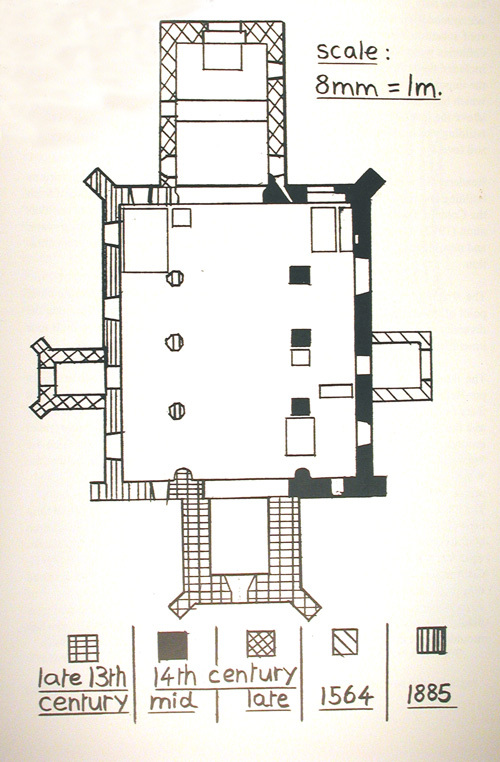 Readers will note how the centre line of the structure has shifted during the various building and rebuilding processes. Electric lighting was installed in 1935 as a gift from the Colonial Dames of America. A further refurbishment is presently under consideration (1992) which will include screening off the ringing chamber, providing water and new electrical services for lighting and heating, together with complete redecoration. The Washington Family - it is the church's links with the family which are the chief point of interest to the many visitors. A perusal of the visitors' book will illustrate the diversity of nationalities who find a visit to Sulgrave worthy of inclusion in their tour itineraries. The Washington Memorials - these are situated at the east end of the south aisle. In pre-Reformation times an altar stood under the window and in the south wall beside it there remains the trefoil-arched recess or piscina, in which the priest rinsed his hands and the chalice. It has a small outlet by which water passed away into consecrated ground. The actual position of the early altar is now occupied by the pew in which the Washingtons sat and immediately in front of it beneath a tombstone lie members of the Washington family. The Washington Pew - at the restoration of the church in 1885 the seat, which had long been customarily used by the owners of the Manor House, was thrown out of the church by the contractor. It was rescued by Mr W. T. Peareth of Thorpe Mandeville Manor, where it was stored until his death in 1917 when it was purchased by the Rev. W. G. Cruft of Greatworth. In 1924 it was acquired by Sir Charles Wakefield who restored it to its original position in the church on 25th July in that year and in the presence of a large congregation, a ceremony of unveiling, presenting and dedicating the pew was held. The pew is constructed of small oak panels with characteristic Elizabethan moulding set in a moulded framework and was probably 2-3 feet higher originally. The Washington tomb - is set immediately in front of the pew beneath a 6 feet slab of local Hornton stone. Here lie Lawrence Washington, his wife Amee Pargiter and Robert, their eldest son. Althought there is no memorial to Robert it is inferred from a stipulation in his will proved in 1620 that he is also interred in the family tomb. 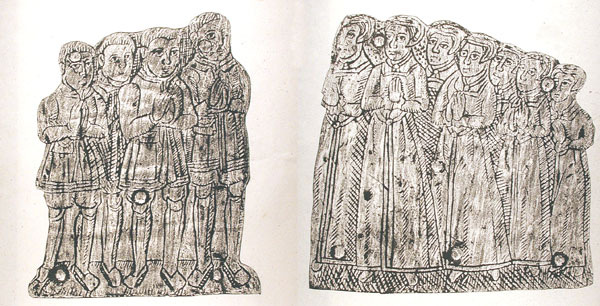 The stone originally bore six brass plates including a shield on which were inscribed their names and the date of his wife's death on 15th October 1564, and two further plates bearing effigies of their four sons and seven daughters. 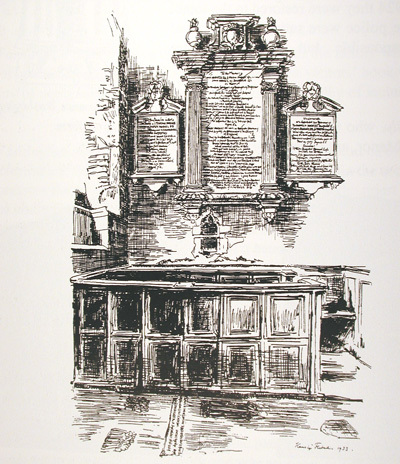 In August 1889 the tomb was sacrilegiously despoiled and the two brasses of the children removed. At the same time the head of Lawrence was cut from the effigy of his body. 34 years later the brasses were located and in 1924 they were restored to the tomb. Records show the police were satisfied that a local person was responsible but no charges were brought. The Hodges family, who followed the Washingtons as owners of the Manor, are commemorated by three marble tablets on the South wall. 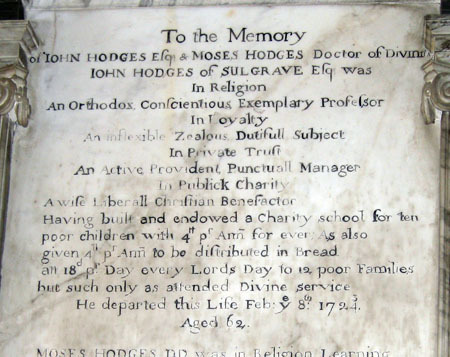 The central tablet is to the memory of John Hodges and his brother, Rev. Moses Hodges, both of whom died in 1724. This tablet is an admirable example of the decorative style of the early Georgian period. The smaller tablets refer to the wives of John and Moses and other members of their families, all of whom are believed buried in the Washington vault, since, during the restoration of 1885, the coffin plate of Lydia Jackson, a grand-daughter of Moses Hodges, was found. At the corner of the Washington pew, in the wall between the window above it and the chancel arch, is an oblique aperture commonly known as a squint. The purpose of the squint was to allow the high altar to be seen by the occupant of this pew and was only restored as an opening in 1885 having been blocked up in post-Reformation days. The Chest - provided for storage of valuables such as the church plate, vestments and ornaments for the altar. it can now be found on the left just inside the south door. The Sulgrave chest is believed to be at least as old as the church itself, is formed from a single tree trunk and measures 20 inches high, 28 inches across and almost 6 feet long. It is hollowed out into two compartments with wood some 4 inches thick between and around them. The lid, on account of its weight, is sawn in half, each half covering one of the cavities and overlapping the partition. The chest is heavily bound and clamped with iron bands placed so close together that little of the wood remains visible. Each lid has five hinges terminating in massive iron hoops. During its history, apart from its traditional use as a secure repository for church valuables, it has been used by William Abbott, church warden and highwayman, for safekeeping of his ill-gotten gains and, after its removal from the chancel in 1885, for storing coal. The original organ was presented to the church by the Colonial Dames of America in 1930 but replaced in 1975. The two electrically powered manuals and wide range of stops and pedals provide for effective musical accompaniment to all worshippers in the church. The font stands beside a pillar near the South door. The bowl dates from the time of Charles II and is carved with a conventional leaf decoration in the manner of the period. The octagonal stem and base date from the fifteenth century. Lest it be thought that only the established religion is catered for in Sulgrave, two non-conformist chapels, Methodist and Baptist, were built during the 19th century and were in use until about 1970. The Baptist Chapel, which stood in Little Street, was demolished as unsafe in 1976 and a house now stands upon the site. The Methodist chapel stills stands in Manor Road outwardly unchanged but converted to a house inside. Sulgrave Church possesses a fine peal of six inscribed bells, and also a small sanctus or Priest's bell, which is medieval, but bears no inscription. In connection with the bells there is an interesting document in the Public Records office, dated 1552. It is an inventry of the goods belonging to the Sulgrave Church. From it we learn that the church then possessed four bells and a Sanctus bell - evidently the one that is still there. The are described as: "Item iiij bells in the Steeple and a Sanctus bell whereof one is sold as appereth in the defants". 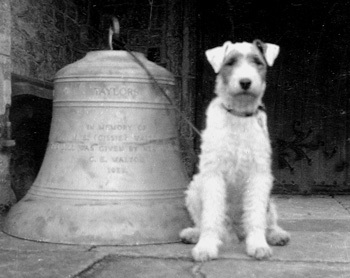 With regard to the bell referred to as sold, the document goes on to state that the churchwardens, John Humfrey and John Mayo, had disposed of it to Thomas Stuttesbury and Lawrence Washington for £16, that the purchasers had already paid £6 of this, which had been spent on repairing 'high wayes and fordes', and that it was intended to use the remaining £10 in the same way. In the meantime the bell was still hanging in the steeple. in 1932, with unknown guardian. 'Be yt knowne to all that doth me see that Newcombe of Leicester made mee'. Of the remainder, two date from the eighteenth century and are dated 1744 and 1769. In 1928 the Tenor Bell was cast together with a carillon for Louvain and these were inspected in the presence of the American and Belgian Ambassadors. The Belgian presence is a reminder that Ghent in Belgium saw the signing on Christmas Eve 1814 of the Peace Treaty between the United Kingdom and the United States following the War of 1812. Sulgrave Manor was purchased and restored in 1914 to celebrate 100 years of peace between the two nations. In 1954 the Team of ringers comprising William Chester, Barry Saunders, William Yates, Montague Saunders, Lewis Wootton and George Shellard rang a peal of 5040 Grandsire Doubles, being 42 extents (10 different callings). It took them 3 hours and 4 minutes and was rung as a compliment to the Rev. Canon W.S. Pakenham-Walsh, who had just completed 60 years in the Ministry. After a period of silence the bells now ring again, for since 1988 a bell-ringing group has been re-formed and now the sound of the bells is heard regularly.